Design Heaven this Sunday: Get your hands on beautiful things! Are you on the list? 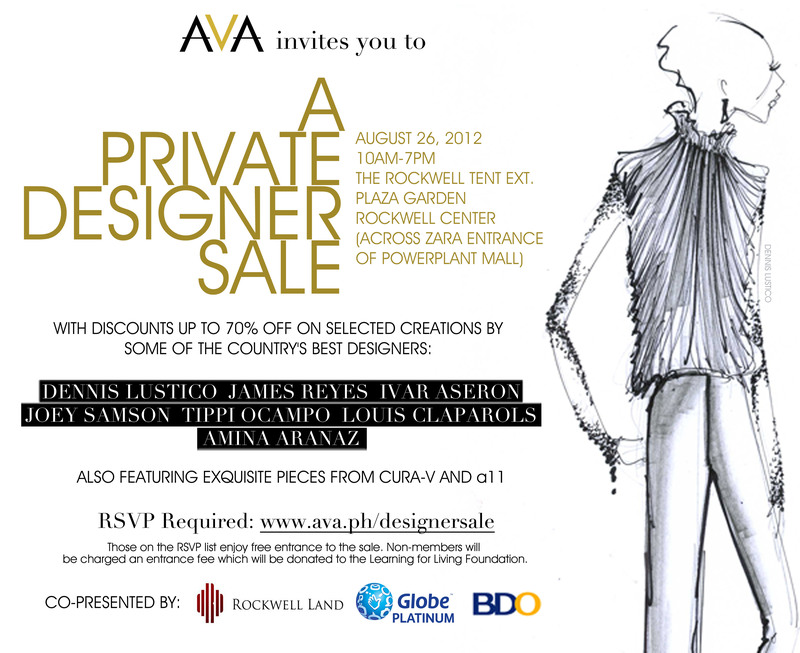 http://www.ava.ph/designersale to register! Another long weekend which is a special treat for us hard-working Manila denizens. If you find yourself in the Metro this Sunday, enjoy design heaven at AVA’s A Private Designer Sale on August 26 from 10am-7pm at the Rockwell Tent Extension, Plaza Garden, Rockwell, Makati. It’s a one-day, members-only affair so make sure you register (for free) at this link http://www.ava.ph/designersale. Why should you spend a part of your Sunday shopping? Because you will given the rare opportunity to purchase couture creations (for men and women) from designers Dennis Lustico, James Reyes, Ivar Aseron, Joey Samson, Tippi Ocampo, Amina Aranaz and Louis Claparols from 10-70% off! If clothes aren’t your thing, then check out exquisite jewelry and home accessories from CURA-V as well as the highly coveted furniture pieces from design gallery a11. AVA is truly the home for beautiful things and now, its first on-ground event will house some of the country’s best designers, come and support our local couturiers and find something (or many things) that is extra special for you or for your loved ones as the Holiday Season starts to drift towards us. A happy Saturday to you all!